The Government Network is building a borderless nation powered by Blockchain Technology, operating from a Decentralised Autonomous Organisation (DAO). Its purpose is to innovate governance one step at the time through the implementation of applications serving direct market needs as drivers for the ecosystem. The goal is to build a nation, operating on a decentralized governance model, that empowers the people with abilities to achieve their goals independently through the power of technology. The DAO’s government structure will be determined by a constitutional convention of experts elected by the early citizens. The platform will consist of a network of incorruptible, interconnected decentralized services, each optimized for their purpose, together with greater than the sum of their parts. Transparent by design, the platform will operate as a self-regulating entity or DAO, governed through an impartial consensus mechanism and constitution. Practical in approach, the DAO works in conjunction with society for the betterment of individuals, communities, and global governance. The Constitution will be drafted by a constitutional convention of experts elected by the early citizens. The Government Network aims to build a borderless nation powered by blockchain technology. First, of its kind, a political structure married to technology as a leading example of a digital government environment, to create a free nation built for the people, by the people. The Government Network aims to attract citizens unsatisfied with their current Government, idealists believing in a borderless society, and those motivated by financial, business or personal incentives. Citizens are incentivized to actively participate in the platform and take further responsibility. Education on the use of technology and the blockchain take a prominent role. Private initiatives are encouraged, and through a series of API’s the Nation will aim to enable the creation of governance, business or humanitarian Dapps to aid governance, business or humanism. The Nation will be home to a free market, for all citizens, across countries and communities, free to join, supported by a framework providing security and practicality to its citizens. The token economy is directed toward enabling maximum market participation. This goal is realized through the creation of a platform token. The NTN token has an infinite supply, characterized by instant minting/ burning of the token when bought or sold on the internal exchange. Each NTN token will have a predefined fixed value of $ 1. 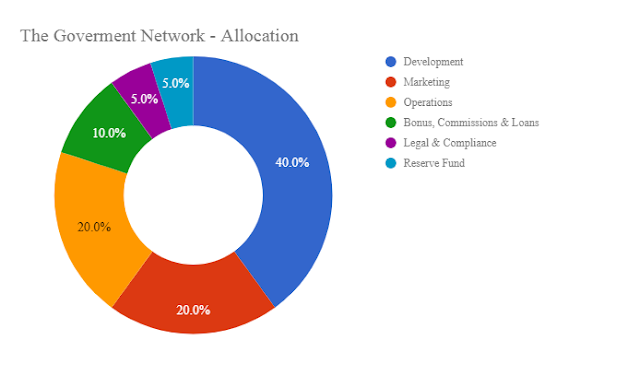 The long-term goal of the Government Network is to replace the dollar as the fixed value of the NTN tokens to the value of a basket of consumer goods and services paid for in cryptocurrencies. The Government network aims to become a reference for governments as a sustainable and empowering digital governance model. The initiative spreads a concept of digital and voluntary participation. The Government Network will provide the tools for its citizens to become self-ruling and solve their own issues and needs independently. The Government Network proposes a sharing economy model, based on decentralized applications. The trusted environment created by the Government Network allows for the maximum participation of each citizen. Its creation is realized through market participant verification, financial services including direct money transfers and (aggregate) escrow accounts, and the facilitation of communication. The technology empowers the citizens to share their thoughts, products, and services, unlocking their true potential. Bonus => 30% discount during the PreSale from the CrowdSale price. Additional discounts per package. - GOV tokens and referral earnings distribution. 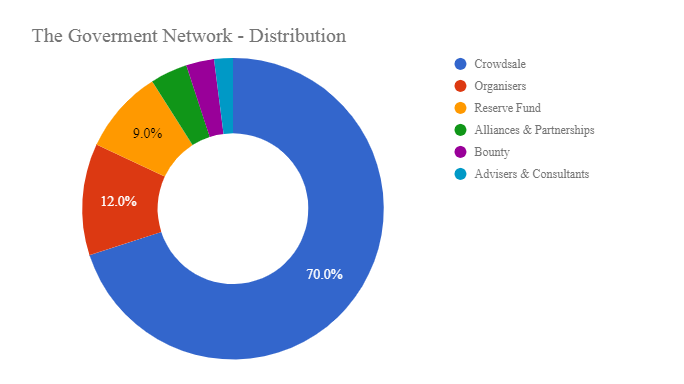 - GOV Token Exchanges listing. Presentation of the Constitutional Convention, candidates, brought forward by the organizers and early citizens. The launch of the first pilot application. The release of preregistration for citizenship at the launch of the DAO.